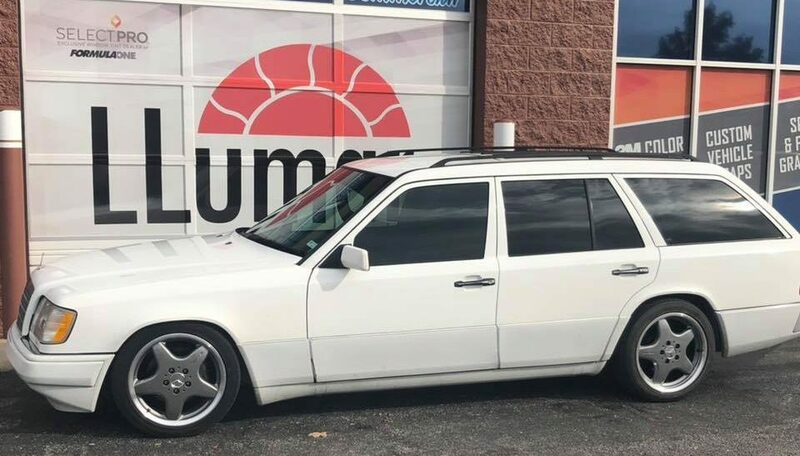 Have you ever wanted to get your 1995 Mercedes E320 tinted? Here at Custom Tints, we tinted another one of Miguel’s vehicles… This time he brought in, from Lake Saint Louis, Missouri, his 1995 Mercedes E320 tinted. Since it’s an older car, it already had tint on it, but by the looks, it was about ten+ years old. So we removed the old faded, purple and bubbling tint on all the windows and we re-tinted it. Miguel choose to go with our Llumar film Classic series Formula One line. We did AFC 5% bd (behind driver) and 35% dp (driver & passenger) plus a 5% sun strip on the top of the front windshield. Check out Miguel’s 5Star Review he left us. + pictures of the car. All our films come with a nationwide limited lifetime warranty and we guaranty the best job around! As you can see, we love what we do and take pride in our work. At Custom Tints shop you get a combined 50 years experience of expert Tinters at your disposal… Our staff/installers have been around this window tinting industry for a long time now. Ask us anything window tinting you want and we are here to help. We want to serve. We have invested our life into becoming the best window tint installers we can be. Investing in the highest quality film out there on the market today for you, our customer that wants the best of the best is what we do. So now it’s your turn to invest in yourself in the comfort of your car. Feel free to Like, leave a comment below and Share this post on your social networks. 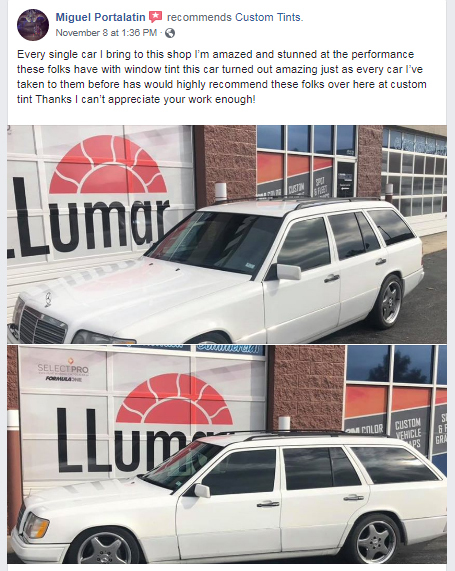 Thanks for checking out our 1995 Mercedes E320 tinted post.